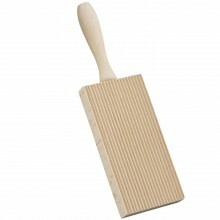 Prepare gnocchi the old fashioned way with this grooved gnocchi board. The grooves help retain the sauce. Comes with a small rolling pin. Made of beechwood. Can also be used to create grooved butter balls. I've been making gnocchi since the moment I could walk. I remember propping myself on a stool and helping my mom roll gnocchi using the bottom of a bread basket with straight lines. The gnocchi were always made out of mashed potatoes with lots of flour. The texture had to be chewy. The more flour it took, the better it tasted ... or so how my mom was taught when she was growing up. We never used any measurements. It had to feel right. When I became older I played around with the ingredients and found that 1 part mashed potatoes to 2 parts flour worked well. Sometimes you could add salt but a good Italian cook knows that the flavour is always in the sauce! A few years back, I went to an Italian restaurant in Windsor's Little Italy (click here for more restaurants) called Il Gabbiano and I ordered their Gnocchi al Gorgonzola (check out their menu here). They were the best potato gnocchi I ever had! They were soft, light and melted in your mouth. I had to learn how to make them! Eventually I realized that all you had to do was use less flour, so I started making them with 1 part mashed potatoes and one part flour. The cooking time also reduced from 12 minutes to 4 minutes. However, I have never been able to duplicate the Gorgonzola sauce. I have yet to come up with (or find) the perfect recipe. •if the ricotta looks moist, then drain it in cheesecloth (or a clean dish towel) in the refrigerator for 8-24 hours prior to using. •when mixing flour with ricotta, try not to over mix (just enough for it to come together). •if ricotta doesn't roll well or falls apart, then add a bit more flour. •for a chewier dumpling, add two parts flour to 1 part ricotta; for a softer dumpling, add 1 part flour to 1 part ricotta. •ricotta gnocchi can be frozen but they will taste gummy when defrosted and cooked. It is highly recommended that they be served the same day. •also, do NOT store gnocchi in the refrigerator covered in a plastic bag. The moisture will make them stick to each other. Store them at room temperature before serving (on the same day). •the gnocchi can be cooked all at the same time. They will not stick together. I have read on other blogs that they need to be cooked one at a time. That is very time consuming. Just wait till they float to the top and they are ready to be drained and served with your favourite sauce. Click the button below to add the Gnocchi Board to your wish list.